Black holes aren’t shaped like donuts after all, and actually look like water fountains instead, according to new research. “Previous theoretical models set a priori assumptions of rigid donuts,” said Keiichi Wada, a theoretical physics professor at Kagoshima University, Japan. Scientists believed that as surrounding matter is sucked into the void, it piles up around the black hole creating a donut-like structure. A paper published in The Astrophysical Journal, however, shows that the particles of gas gush out and are not rigidly held in place in an accretion disk. The researchers examined a supermassive black hole in the Circinus Galaxy, 14 million light-years away from Earth, using ALMA (Atacama Large Millimeter/submillimeter Array), an astronomical interferometers made up of 66 radio telescopes. The galaxy contains an active galactic nucleus (AGN), a luminous source of energy that is created from greedy black holes gobbling matter. That ‘donut’, however, isn’t rigid. Instead, it’s made up lots of different gaseous parts. 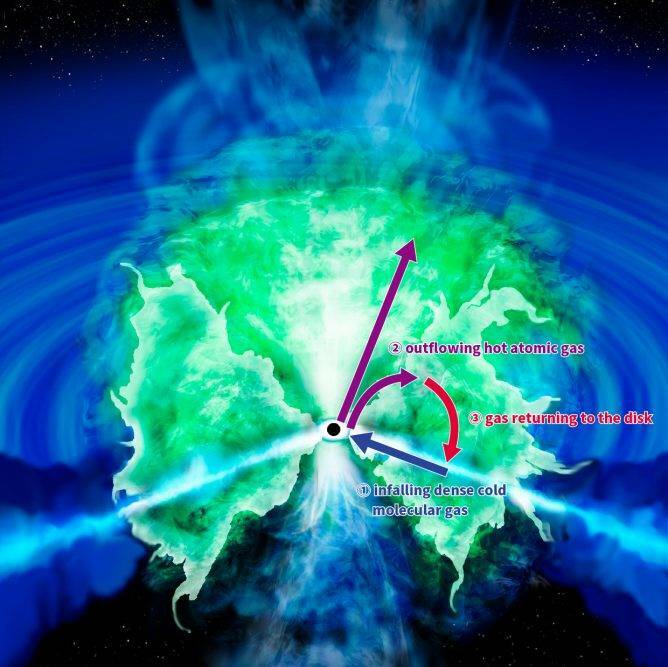 Cold molecular gas getting sucked into black hole creates an accretion disk. As it edges closer to the abyss, the gas heats up and the molecules are ionized. The atoms are deflected above and below the disk and come crashing back down onto it, like water being sprayed from a fountain. A big killer fountain. The process that creates the water fountain-like structure. Image credit: Wada et al.